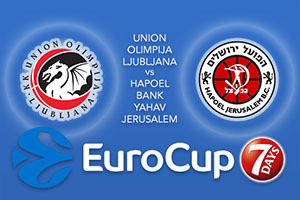 The hosts are already 0-2 in the Eurocup but it doesn’t look as though things are going to get any easier for them. This is definitely a tough challenge for the team playing at Arena Stozice and the fact that they are the youngest team in the Eurocup, averaging at 22.9 years, is going to raise questions over whether they have the experience they need to compete in this league. The host have lost both of their games by an average of 6.5 points, which is definitely a bad starting point for the regular season. These defeats have come despite the fact that Brandon Jefferson has averaged 18 points a game. There has also been 13 points from Nikola Jankovic and Devin Oliver is also in double digits with an average of 11 points. This means that Olimpija have things to work on and take pride in, but they definitely need to do more and this is going to be the ideal opportunity to start. If the hosts slip to 0-3, they could be in for a very difficult time this season. While discussing ages of the two squads, the Jerusalem side has one of the oldest teams in the league. Their average age of 28 sees them ranked as the third oldest squad in the league so this could be an interesting clash between youth and energy against wisdom and experience. The away team this week also got a win on the road last week and they come into this match with a 1-0 record. A lot of this is down to the 18 points scored by Curtis Jerrells but there was also 17 points scored by Jerome Dyson while Amare Stoudemire managed to grab a double-double with 10 points and 10 rebounds. The away side are being backed by the bookies in this one but the hosts have a lot to prove. This is why backing Union Olimpija Ljubljana at +9.5, which you’ll find at odds of 1.90, should be a smart bet. For the Over/Under market, you’ll find going OVER 158.5 which is provided at odds of 1.90, is of interest. Bet Now!